The “10 Days of Giving” runs from December 1-10, with Merchants Bank employees helping the community collect food to benefit the food shelf programs operated by Winona Volunteer Services and the Southeastern Minnesota Rural Education & Resource Center in St. Charles. Last year, the “10 Days of Giving” set a record by collecting more than 280,000 pounds of food, putting the 25-year total at 2,377,227 pounds. Two pounds of food are calculated for each dollar brought in, although the reality shows that monetary donations often have a greater impact. “Every year we are amazed at the generosity of the people in our area,” Metzler said. In Winona in 2013 Winona Volunteer Services had 906 households using the food shelf each month, with another 93 households per month use the emergency food shelf. In total, an average of just over 37,255 pounds of food was distributed each month in 2013. As in the past, Merchants will be collecting at its locations as well as schools and businesses around the area. For questions, please call Metzler at 494-0524 or Welch at 457-1108. The “10 Days of Giving” will officially kick off with a press conference at 10 a.m., December 1 at Merchants Bank in downtown Winona. 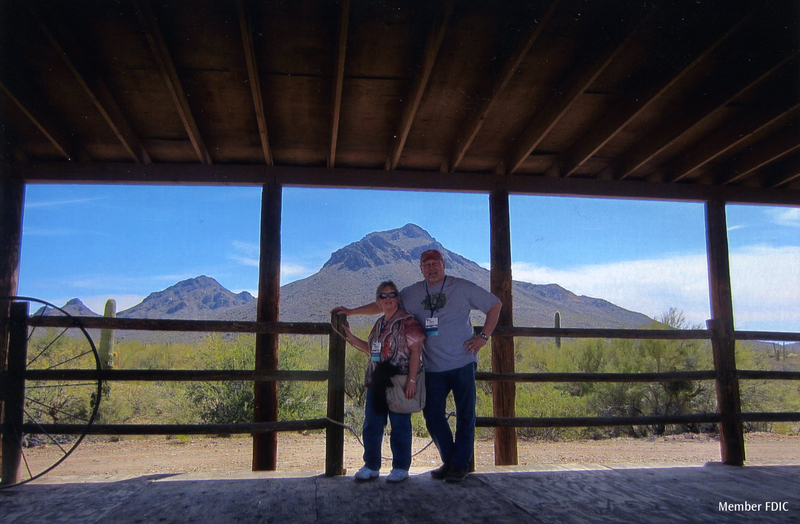 Nancy Denstad, on vacation with her husband Tony in Tucson, Az. I started in the Proof Department (now Item Processing) at Merchants in 1985. Since then, I’ve had several positions throughout Merchants including as a Teller, Personal Loan Assistant, Personal Loan Officer and a Customer Service Representative. I’ve been in my current role as Deposit Account Services Manager since 1993. I feel very strongly about the importance of saving early. As soon as you get out of school and get a job, start contributing to your retirement. If your company offers a retirement plan, make automatic payroll deductions to that plan right away and don’t stop. You’ll be surprised at how much those extra years help your money grow. If I wanted something, I had to save for it and buy it myself. They made me a saver, and I’m glad that they taught me that. It’s a something I’ve really tried to pass on to my own children. If you could ring the bell at the New York Stock Exchange with anyone, who would it be and why? It’d be fun to have my husband and children in New York with me. Ireland. I went on a vacation there a few years ago with my husband and some friends. We traveled the entire country and I’ve love to go back. Switching to a high deductible health plan in 2015? Click here to learn more about Merchants Health Savings Account options and how Nancy can help. For the past seven years, gift cards have been the number one most wanted holiday wish list item, according to the National Retail Foundation. The popularity of gift cards has steadily increased throughout the last several years and will culminate in an estimated $100 billion dollars loaded on to gift cards in 2014*. 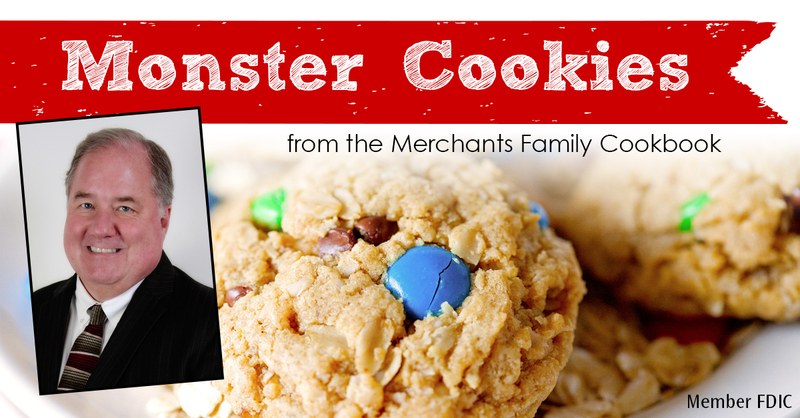 Offering gift cards is not only what your customers want, but it’s easy with Merchants Bank! Through our partnership with Valutec, you may begin offering personalized gift cards at your business in as little as 10 days. Simply speak to our Credit Card department by calling (507) 457-1160 or (800)-944-6285 to get started. From December 1-10, the “10 Days of Giving” food drive and other events will be held at a number of Merchants Bank locations, including Winona, St. Charles, Onalaska, Cottage Grove, Hastings, Caledonia, Spring Grove, Cannon Falls and Red Wing. In 2013, 23,140 individuals were served at the food shelf at Winona Volunteer Services, and another 2,461 individuals were served with emergency food. An average of 906 households were served each month. An average of 93 households used the Emergency Food Shelf services each month in 2013. An average of 37,255 pounds of food was given out through food shelf programs monthly. 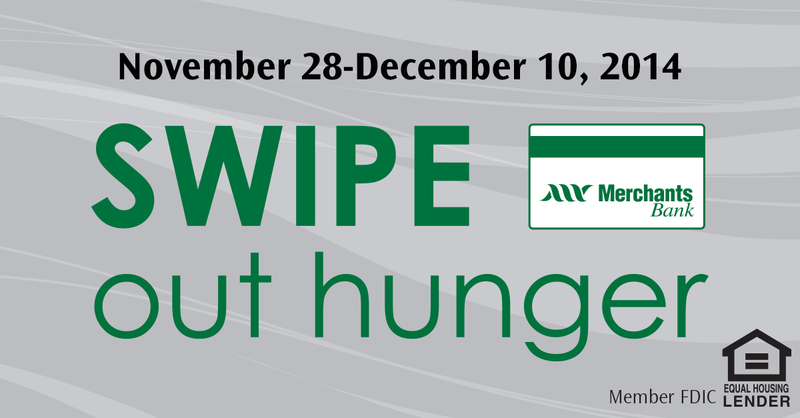 Winona – You can drop off money or food at Merchants Bank in Winona, Goodview or Lakeside between December 1-10. You can mail a donation to Merchants Bank, 102 East Third Street, Winona, MN 55987, attn: “10 Days of Giving.” You can make a donation online by going directly to the Winona Volunteer Services website. Indicate “10 Days of Giving” after entering your name. You can also bring donations to the Holiday Train held at 4 p.m., December 9, Amtrak Station. St. Charles – St. Charles is holding its “10 Days of Giving” December 1-10 to benefit the Southeastern Minnesota Resource Center. Please bring cash or food donations to Merchants Bank in St. Charles. Onalaska – Onalaska employees will again be hosting the La Crosse Rotary Lights Event December 2 at Riverside Park in La Crosse, WI. Please bring cash or food donations that night to the event. Cottage Grove – Cottage Grove will be holding its “10 Days of Giving” between December 1-10 to benefit the Friends in Need Food Shelf. You can bring cash donations or toiletry items to Merchants Bank in Cottage Grove. You can also bring donations to the Holiday Train held at 5:45 p.m., December 10, south of the Sieben Bridge, in front of the Youth Service Bureau. 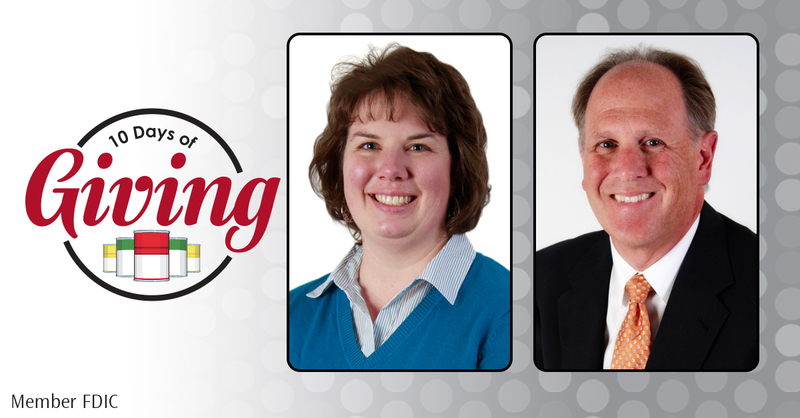 Hastings – Hastings will be holding its “10 Days of Giving” between December 1-10 to benefit Hastings Family Service. Bring cash or food donations to Merchants Bank in Hastings. You can also donate at the Holiday Train stop at 8:30 p.m., December 9, at Canadian Pacific Depot, 500 E. Second Street. Red Wing – Merchants Bank in Red Wing will be hosting a Change Collection, where they will collect the change you donate and then donate that money to benefit local people in need. It’s a great way to empty your pockets and change dishes to help others. Cannon Falls – Merchants Bank in Cannon Falls will also be hosting a Change Collection during the holiday season at the Bank to benefit local people in need. Spring Grove – Merchants Bank in Spring Grove will celebrate the “10 Days of Giving” by giving area residents an opportunity to purchase a bag of groceries supplied by Red’s IGA for people in need. Stop in the Bank for more details. We know this is a busy time of year and many organizations have a need. We hope that you will consider the “10 Days of Giving.” Thank you for your consideration. Cream eggs, sugar and butter. Add vanilla, syrup, soda and peanut butter. Mix well. Stir in oatmeal. Fold in M&Ms and chocolate chips. Bake at 350 degrees for 8-12 minutes. Cook’s note: I use more M&Ms than the recipe calls for (about 1 1/2 cups).